Shopping for Star Wars Coasters? Protect your tabletops with the power of the Force! 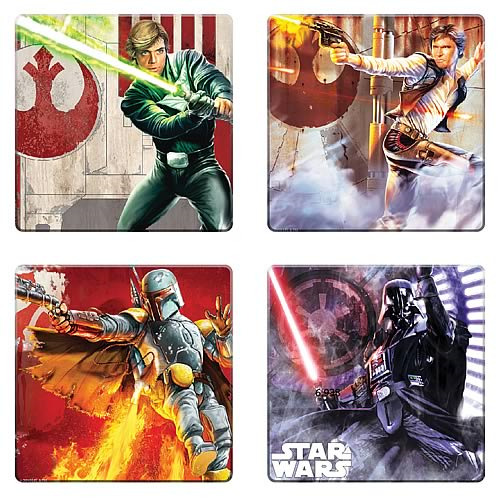 4-Pack of wood coasters features Luke Skywalker, Han Solo, Boba Fett, and Darth Vader. Non-slip, cork-backed coasters with packaging art from Hasbro's Unleashed collectible figures! Protect your tabletops with the power of the Force! This 4-Pack of wood coasters includes Luke Skywalker, Han Solo, Boba Fett, and Darth Vader. With non-slip cork backs, they're perfect for the Star Wars collector/entertainer in your life. Order yours today! Coasters measure about 4-inches tall x 4-inches wide x 1/4-inch thick.